When it comes to accomplishing a dream, Forum Dance Theater sets a good example. The Company began fifteen years ago as an after school dance group with five members; under the direction of Ocampo since 2000, and before that of founding Artistic Director Kelly Hayes, they’ve established themselves as an accomplished and widely respected program for aspiring young dancers. 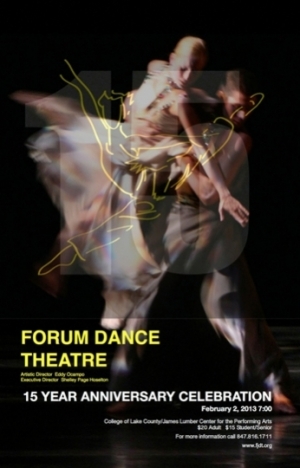 Forum Dance Theatre is now includes forty-nine members, an artistic and administrative staff of nine, and over fifty volunteers; originally named Forum Contemporary Jazz Dance Theatre, they dropped “Contemporary” from their name in 2000 and “Jazz” in 2012, becoming Forum Dance Theatre. In their Fifteen Year Anniversary Celebration, the Company will be performing works by Guest Choreographers Nick Pupillo and Preston Miller, as well as works by Ballet Master Brent Caburnay, Second Company Director Kimberly Fletcher-Stibal and Ocampo. It’s an impressive line-up, a group of respected and experienced choreographers whose professional credits include a virtual world tour of dance, and their creative participation is characteristic of the high level of professional experience that members of Forum Dance are exposed to. Even more remarkably, these young performers are very much prepared for just such opportunities. Forum Dance Theatre company members typically spend fifteen to twenty hours a week training, in addition to rehearsals, which can reach another twenty hours a week during their busy season. Not surprisingly, the Company’s approach includes an emphasis on skills in time management and the art and science of making choices, in addition to the high level of dance performance. The results are exceptional, not only in what the Company members always bring to their audiences, but also in what they themselves take with them. That’s certainly the impression you get from the way that Forum Dance alumni describe their time with the Company. Forum Dance Theater’s performance at the James Lumber Center for the Performing Arts is certain to be impressive; anyone who has seen them perform will know that. All the same, as impressive as the Company’s artistic success is whenever they take the stage, it may be that their most important accomplishments are somewhere beyond their many memorable performances. Their greatest successes are found in all of the futures that they work so hard to prepare for.